Dunno if I pointed it out to the kids or the kids pointed it out to me: on the main A1214 to Woodbridge, there's more than a fair few businesses prefixed with the K-word. 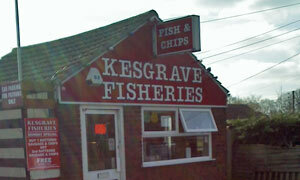 Which is absolutely as it should be as This Is Kesgrave. Already ticked off the static tables of the alliterative Kesgrave Kitchen this time last year. Take an Usain Bolt jog down the road -- much like that PM fella did the day before -- -- and you won't miss the upper case delights of Kesgrave Fisheries. You're right, it's a chippy, though there's something admirable about that "fisheries" phrasing. No piscine puns in this particular parish, ta very much. Plenty o' parking -- patrons only, says the sign -- and be sure to keep one fish-eye on that bike lane stroke path stroke pavement. Can be perilous cycling past this place (hey, no "i" before the "c") around 6pm when you can easily get yourself battered. Four days late for the Monday special: "buy 1 battered sausage & chips get 2nd battered sausage & chips FREE". Nonetheless, one S&C for me, please, and I'll take one of your (non-Heinz) ketchups too. Ooh, and a playground-sized bottle of Tuck Shop dandelion and burdock, as recommended in a recent Good Food magazine. Declined the healthy option of deep-fried pizza and scollops (sic). Had to wait for a while for fresh chips and Grenvyle's fish. Unlike Andy, I opted out of the mushy peas: them marrowfats ain't practical. Back in the limo and away to K. Community Centre: you know, the one near the guided bus route. Maybe there'd been some seating in the bandstand prior to a vandal visitation. We settled for a bench by the side of the playing field, thankfully warmer than that by the Tidemill. We tunnelled our way in to our well-wrapped lunches and got down to some serious scoffing, rising to the challenge of our mightily generous portions. Phew, stuffed. Then nicely topped off from a takeaway coffee from Tesco's mechanical Turk of a Coffee Nation machine. Seriously, you could fit a man (or several trainee kid baristas) in there. If it was a car -- Triumph Dolomite. If they were passing by -- Craig Cash.